Another article on the many different permutations of a popular and confusing fragrance: Kenzo Flower and its many concentrations, different editions and limited editions, dissected following the tradition on Perfume Shrine to guide you through the variety. [If you want to see more articles of this type, check the bottom of this post]. 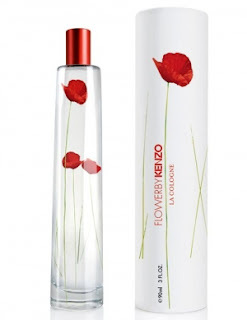 Flower by Kenzo is the original release from 2000, created by Alberto Morillas. The bottle depicts a poppy inside the cap of the bottle in various degrees of wilting according to the size of the bottle. The bottle is white with a red poppy painted on a stem. Kenzo Flower Le Parfum is a "parfum"-like concentration of the original Kenzo Flower, issued in 2003, with boosted vanillic and powdery notes however which give it a different enough character. 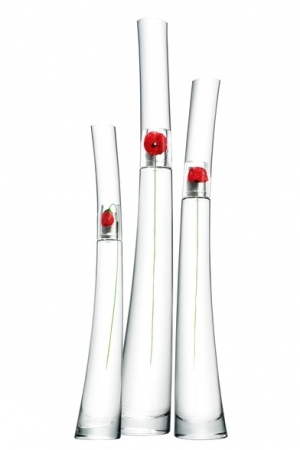 Three editions according to size with different names were issued: Satin Spray (75ml), Natural Spray (50ml) and Just a Drop (15ml). Kenzo Flower Le Parfum highlights the notes of opoponax resin, white musk, vanilla, almond and Bulgarian rose. The perfume is encased in a shiny red metal bottle and in a red box, again with the familiar poppy painted down the side of the box. 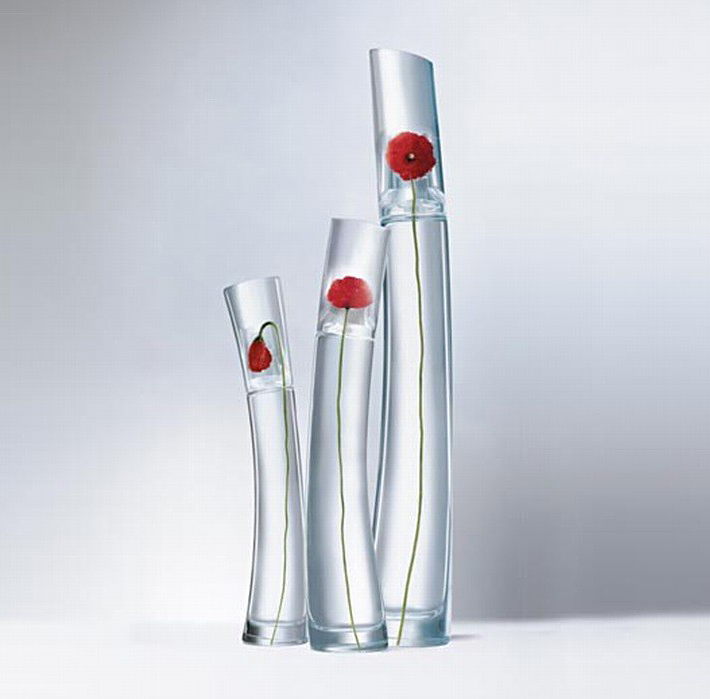 Flower by Kenzo La Cologne is the latest concentration in the "original" fragrance of Kenzo Flower, from 2010 and is presented in a homogenous style of bottle: again white box with red poppy, but the bottle is cylindrical with a metal cap that doesn't hide any flower inside and the box is similarly rounded to hold it. The piquant start of bitter orange (bigaradier) keeps it fresh, with a green-like note, and less powdery overall. Kenzo Flower Oriental is a rather different incarnation from 2005: a patchouli-amber oriental fragrance in a bottle with a black poppy instead of red inside the cap and a subtle red script down the side of the bottle. 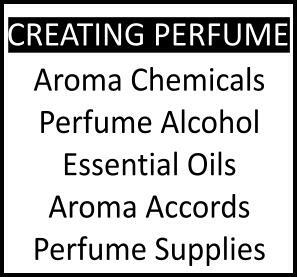 The fragrance is distinctly different from the woody powdery of the original and should not be confused with it or Le Parfum. The addition of dense, smoky incense and pepper create a distinctly "orientalized" fragrance. The bottle is white with a black poppy painted on instead of red. Kenzo Flower Essentielle from 2009 is composed of Damascus rose absolute and jasmine absolute, with the background notes of vanilla absolute, incense and three sorts of musk. 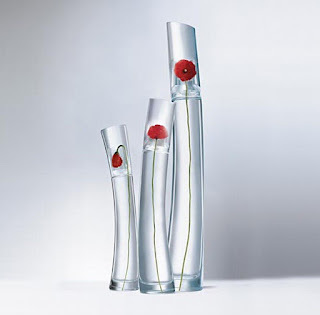 The bottles shaped like its antecedents, with the poppy tucked inside the cap, are leaner this time and accentuate their graceful arc with a long body and a pronounced cap. The box is the same as the original release, so care should be taken to differentiate with the "essentielle" mention. 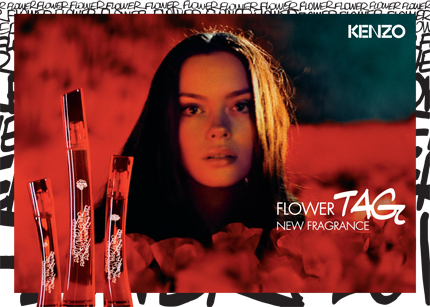 Kenzo Flower Tag is a fruity floral with a quite departed role in the line-up: the citrusy fruity touches are perceptible first as a more youthful approach to the classic woody-powdery violet of the original. Two editions are available: Eau de Toilette (2011) and Eau de Parfum (spring 2012), the latter adding more gourmand/foody nuances in the background with praline, patchouli and vanilla. The bottle in both cases is red glass with black graffiti lettering on it down the side, while the box is also red with black "Tag" in bold lettering. You can check PerfumeShrine's previous entries on the different flankers/perfume editions of Dior Poisons, the many flankers/limited editions of Dior best-seller J'Adore, the variousreformulations/repackaging of Miss Dior Cherie, the super confusing group of fragrance editions by Rodriguez Narciso For Her with their differences highlighted, the Etro Via Verri original and reformulated editions, the Shiseido Zen perfume editions and Hermes Merveilles perfume range different editions. I always kicked myself for not getting a bottle of the le parfum version because that one was very good. Back before I had enough courage to jump into getting decants, I had bought a full bottle unsniffed of the regular Kenzo Flower. Let's just say that it reminds me of Play Dough on skin. I think that I was enamored by the bottle. Mind you, that I have not been very impressed with a lot of mainstream perfumes and it's rare that I am. 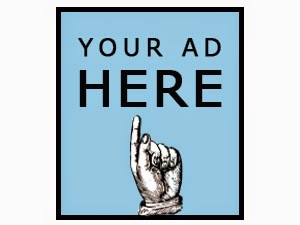 Thanks for your always informative posts - hard to navigate all these different editions. Having just acquired a vintage Royal bain de champagne, now I need to do a three way side by side comparison (RBC vintage, current, and Flower) to evaluate Turin's claim that Flower is a resurrected RBC. it was a cozy soft oriental that had that fuzzy backbone of oppoponax we so love in old style orientals...hard to beat that. I think some might be still online on discounters, though, surely? Play Doh, you say? Interesting. There is some heliotrope there which is the predominant note we associate with that clay-playing putty. I have heard an association with baby diapers and wet-wipes (the second is even more accurate, as per my personal experience as well) too, which makes sense as the fragrance has been the prototype to compose a function product scent (for diapers and wet wipes in this case)! now that the cat is out of the bag, so to speak, that all the exclusives from Paris are available in the USA at Barneys (please refer to my previous entry on this issue), I don't really see the point on the LE "export" version of an exclusive. This might be why they have not told me anything about one this time. It means a change of a business model. As a Scotland resident, you should have access to all the Paris scents anyway through their site or phone order though, right?? Those two you mention are prime for being widely available though, if it actually happens this year. Thanks for this! Unfortunately I think both Miss Dior Cherie and Narcisco could use an update! They just keep churning them out, no? I believe both posts you have mentioned have been updated with the latest information available up to a month ago*. I don't know of any other releases they have added to the line-up of Narciso, since surely the Essence Musk collection is a separate fragrance - I mean there's the NR For Her variants and the NR Essence variants, latter of which I haven't occupied myself with yet. The For Her entry is conclusive as of this time. *NB. Except for the August 2012 Miss Dior Parfum edition which I plan to include shortly. You've got a comprehensive information on the various scents by Kenzo. Putting them under one post provides us with a one-stop venue to compare the editions. 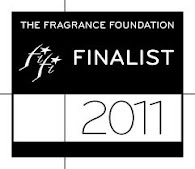 What are their latest scents or editions this 2012? nice site there you have. A bit of a commercial to link it, but I'll let it this time. Where can I buy kenzo flower le perfum - just a drop (15ml) bottle. Where can I buy kenzo flower le perfum's just a drop (15ml) bottle...!? There's bound to be some circulating on Ebay? (search!) Try discount etailers too, they sometimes have older stock.